This is a Lowel Rifa 44 eXtra/Flo Kit, LB-30 Soft Case. The Rifa 44 eX is a compact, self-contained, 16 x 16", 250W, AC/DC, collapsible soft light that sets up in a minute or less. Bathe almost anything in luxurious soft light, from talking heads to table-top stills. It's the perfect complement to today's compact, light-sensitive, digital cameras and film stocks. The Rifa eX has a unique lamp socket that may be changed out for the included FLO-X3 three-lamp socket that accepts three standard E26 screw-in fluorescent bulbs. 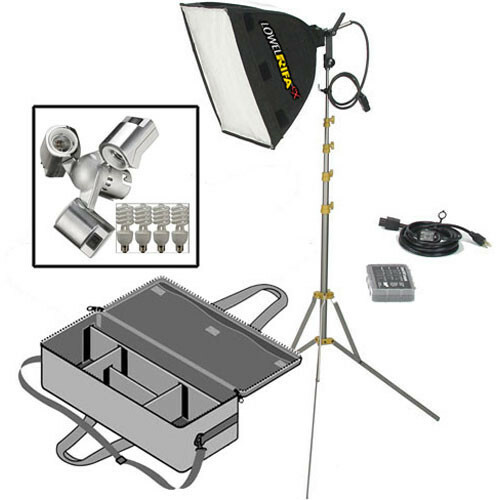 This kit includes one halogen and four fluorescent bulbs, bulb storage cases, compact light stand and an LB-30 soft case. Although this kit is supplied for use with 120 AC voltage, it can function with 220-240 AC voltage with the appropriate optional bulb and adapter plug, available separately. Box Dimensions (LxWxH) 25.0 x 15.0 x 7.0"